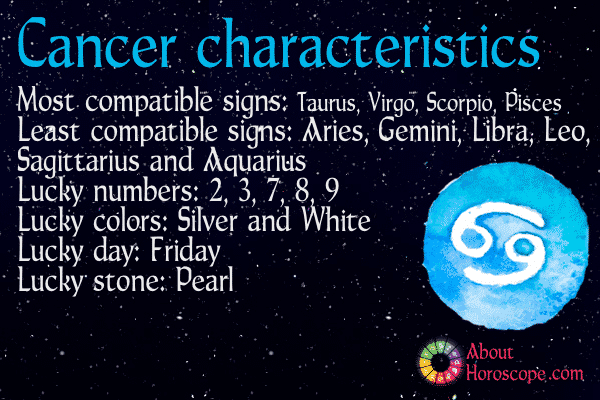 Born between June 21 and July 22 Cancer is the fourth zodiac sign. This is the first water sign of the zodiac, feminine, cardinal and symbolized by the crab. Ruled by the Moon, Cancers are prone to mood swings related to the actual phases of the Moon. Do you want to skip to a section of this page? Use the navigation links below and learn more about Cancer’s traits. It’s not surprising that the Moon has the same effect on ocean tides and on Cancer’s emotions, instincts and habits. Typical Cancer traits include wistful, shy, and mysterious; when unhappy they prefer to escape reality by retreating into their own shell. Their personality can be quite complicated, but deep inside they are conservative and home-loving people. The Crabs are mostly the family types. They love to be in familiar surroundings and nurture their relationships. Strength: Compassionate, sensitive, creative, imaginative, protective of loved ones, tenacious. Weaknesses: Manipulative, pessimistic, clingy, insecure, pack-rat. Likes: Relaxing near or in water, art, home-based hobbies, dining with friends, taking care ofloved ones. Cancer is an awesome sign. You know that already. Show your friends the main characteristics of your sign by sharing the infographic below. The Crabs can come up with brilliant and novel ideas using their imagination. However, in the process they can end up with ideas that may not be too practical, or may be too over-ambitious. The power to think and act spontaneously is a major guiding force for a Cancer-born, and more than reasoning, they rely on their intuition for taking decisions. 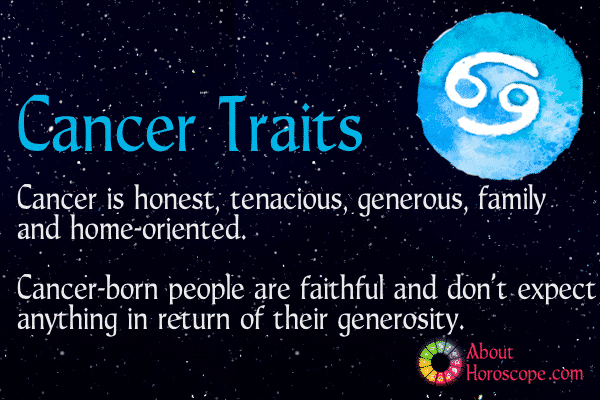 Sensitive as they are, Cancer-born people are faithful and generous towards others, and they hardly expect anything in return for their generosity and faithfulness. They deeply admire and respect people who are near to them. Even those who are far away get to experience the loving side of a Cancer very often. Cancer-born are quite emotional people, but at times they might appear icy and separated. They are very sympathetic to other people and love to take care of them. They are very protective of their personal space, interests, possessions, relationships and loved ones. They are very determined particularly when defending themselves and those they care about. On the flipside Cancers can be very temperamental and moody which can be too much to handle for the people around them. It is observed that they are prone to pessimism and tends to be clingy. Since this sign is very emotional they find it difficult to let go of things close to their heart, and hence, they find it difficult to look beyond the imperfections and move on. Perfect example is American actor Vin Diesel, born 18 July 1967, who transitioned from break dancing to screenwriting to acting then producing. Diesel is known to develop close friendships with the company he keeps particularly with his late co-star from “The Fast and the Furious” franchise, Paul Walker. In 2014, after his visit to the Philippines, Diesel expressed his desire to become a Filipino. Congress approved a resolution to adopt Vin Diesel as a Filipino in the months after. A Cancer man is reserved during the first meeting. It will take a few more encounters with him before he loosens up. Highly intuitive, a Cancer man can often guess at what others are thinking or feeling. At the first sign of overly aggressive friendliness, the crab will sidle out of sight and bury himself in the tide. Tread softly, and wait for him to open up on his own accord. Coming on too strong will not work for this man. Always polite and a little worldly, he exhibits old school gentlemanly manners. Chivalry is not dead with a Cancer man. Tough outside, soft inside – that’s the Cancer man. This tender and loving gentleman might put up a rough exterior to protect himself from emotional harm, but his good heart and willingness to help others make him an endearing friend. Most Cancer men are also very family-oriented, and will want to set up a home filled with the patter of tiny feet. He never takes this lightly but he will only embark on this life’s chapter when he feels secure enough. His home is his sanctuary and it is where he feels safest. A dependable provider, the Cancer man values a strong family unit and enjoys his time at home. Give him a backyard barbeque with friends and family to put him right in his element. Thrifty and shrewd describes the Cancer man when it comes to financial matters. Investments will be solid and made to generate long term earnings over short term gain. Rarely will this gentleman spend his money unwisely, or on impulse. Although the Cancer man will take a hard look at that get-rich-quick scheme, that’s as far as it will go. The Cancer man is stylish, but conservative and favors pale blue and silver. When it comes to fashion and décor, he can tell what works and what doesn’t. Willing to explore the latest wardrobe craze, but not ready to be a trendsetter, the Cancer man’s clothing is selected to reflect sophistication over flash. A good example of a Cancer Man would be Hollywood icon Tom Hanks, born 9 July 1956, perhaps the best personification of “old school gentlemanly manners”. Despite his numerous accolades in acting and his global box office numbers which currently total US$8.3 Billion, Hanks remains firmly entrenched with his wife of 27 years, Rita Wilson and family. Fluid like water, she is both peaceful and passionate. She is a tidal force of bewildering emotions, and can be stubborn, obedient, frantic, and passive, all in the same hour. This sign is the least precise of the zodiac and you’d be hard pressed to spot a Cancer woman amongst the crowd. She is strong willed and persistent, but can sometimes be reserved, drawing away and into her own shell if disturbed. The Cancer woman is sensitive – very sensitive – but not only to her needs, but to the needs of others, making her one of the most sympathetic and caring women of the Zodiac. If you criticize her she will bear a grudge. She likes to mother everyone around them and is a caring and thoughtful friend. A Cancer friend is the one that makes sure everyone gets home safe after a drunken night out, and who calls to make sure you’re doing okay after your bout of flu. There is something comforting about friendships with a Cancer woman, and you know she will be there looking after you should you ever need her. Your Cancer friend’s vulnerability can sometimes be trampled on by a careless, clumsy comment, so tactless, rude, and inconsiderate people need not apply! She highly valuestheir friendships, and she makes cherished friends as well. Ms. Cancer will have a bank account and/or money stashed all over her home. She is a natural saver who understands the value of money. To her, money equals security. It also equals a home and even if she is living in a tiny apartment, she will scrimp and save to achieve her ultimate goal – proud homeowner. The Cancer woman is cautious about everything she does in her life and the handling of money is no exception. She is a shrewd investor and the goal of any financial planning is based on long-term stability. When it comes to fashion, she prefers traditional outfits with an emphasis on femininity and comfort. Don’t be fooled by her apparently conservative fashion choices. She likes the touch of watery satin on her skin and will often wear a luxurious, matching set of lingerie beneath her conventional outerwear. Who else best embodies the Cancer woman than the late Lady Diana Spencer? As a member of the royal family, Diana who was born on 01 July 1961, endured the pitfalls of fame and maintained her focus on lending charity work and support to her various advocacies while maintaining her role as protective mother to William and Harry. Diana was also greatly admired for her sense of fashion which bordered on the traditional yet presented a flair for modern day trends and preferences. The hardy and industrious crab works well in a variety of work environments. Cancers are not afraid of hard work, although the desire to do so will often “come in waves” — leading to sudden bouts of intense creative energy, followed by periods of lower productivity. Cancer’s natural desire to find innovative solutions makes them excellent additions to the team. Cancer individuals are trustworthy and understanding. For the most part they do not take the lead — but rather they are the creative genius behind the scenes which makes it all possible. Cancers are sometimes entrepreneurial, especially in areas of business which require original thinking or ideas. They are often drawn to caretaking and service occupations. They do well in the fields of Medicine, hotel management, teaching, community work, real estate brokerage and human relations. Their sensitivity and powerful emotions lead them to the worlds of arts, music, painting and acting. People born under the sun-sign of Cancer are usually defensive people. Often they are hurt in early relationships, and as they grow older they will put up strong walls and barriers as a line of defense. Break down these walls however, and Cancers will jump into their relationships with a lot of passion and emotion. “I feel” defines Cancer, and this is all too evident when it comes to love. Tender and gentle, they will show sensitivity with their lovers without a second thought. They love readily and choose a mate who can understand them as much as possible. They do not blend well with insincere or overly ambitious partners. The Cancer lover is on the lookout for someone who is intuitive. They are devoted partners, doting parents and loyal spouses. Cancer’s gift of emotional intelligence and understanding is something of a double-edged sword in relationships: On the one hand Cancers are extremely good at emotional communication and empathic understanding — on the other hand however, Cancers can often be easily vulnerable because they’re emotional “sensor” is much more finely tuned. The most compatible signs with Cancer are Taurus, Virgo, Scorpio and Pisces. The least compatible signs with Cancer are Aries and Libra. This zodiac sign having the tough outer shell of the crab also has its soft belly. Even though they may seem cool and in control on the surface, they quite often are prone to emotional troubles. The need for security and pessimism makes them susceptible to gastric problems. Heartburn, gastric disorders and obesity are of major concern to them. Although they are supportive of others close to them, they usually suffer in silence as they are not the type to open up about their feelings. Water retention is also common among them. They should avoid high fat foods and learn to open up about things that bother them to avoid any chances of stomach ulcers. Proper diet is a must because the greatest of worriers tend to overeat and gain weight easily. Lucky numbers for Cancer are 2, 7 and 9 while their lucky day is Friday. So if you are Cancer and are planning to launch a new business or make an engagement proposal, best to encircle Fridays on the calendar which fall on these dates! Lucky colors for Cancer are Silver and White while the lucky gemstone is Pearl, which is to worn as a ring in the small finger. If you have other ideas on how Cancer people really are, don’t hide in your shell and please share your thoughts at the “Comments” section.